Elegant themes is a premium WordPress theme shop that provides stylish yet SEO friendly WordPress themes. It costs $89 for 87 themes that can be used for blogs of any niche (fashion blogs, business blogs, ad monetized blog themes etc). You also get access to bloom (the email optin plugin) for lead generation, and monarch (social sharing plugin) along with the themes. In this Elegant Themes review we'll see why they are the most used themes, how they can help you and everything else, the good, the bad and the ugly. Isn’t your blog your virtual office? If that’s a yes, then why not make it branded and conversion-optimized. Your blog design is the first thing that your visitors notice and it should tell your brand story clearly. But, isn’t beautifully designed blogs and conversion optimized pages a costly affair or a thing of the code-savvy? That’s where you need nothing but the best WordPress blog theme that is super-affordable, has the trust of 437,821 satisfied users and comes as a complete package including a email optin building (to grow your list) and a social sharing plugin (to boost social traffic) all for less than $89. But before that, let’s have an honest review of Elegant themes because you need to know the waters before you get your foot in, right? In this post, you’ll find this Elegant Themes Review very useful since it is unbiased and honest. So let’s see if Elegant Themes is worth your investment. 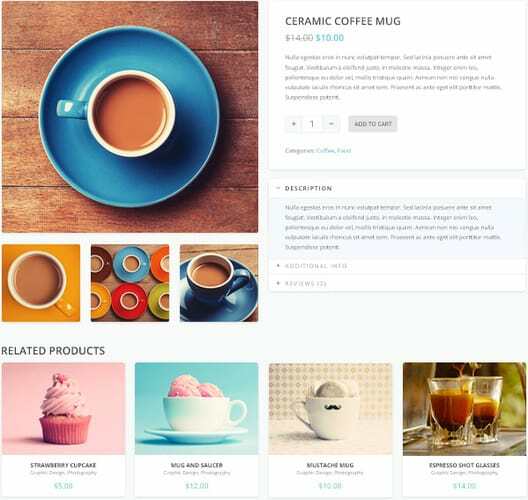 Elegant Themes Review 2019: Most Affordable Premium WordPress Theme Shop? [page_section color=’#EAF9FF’ textstyle=’dark’ position=’default’]Elegant Themes membership by Nick Roach is the most beautiful WordPress Themes in the market. They are modern and sleek and can be used to give your blog a clean and user-friendly look. Elegant Themes has a huge collection of 87 premium WordPress themes that suit for almost any niche you are blogging in. We are not saying it just like that, check out our detailed Elegant Themes vs StudioPress Themes comparison to see why they are a clear winner. If you are looking for premium WordPress themes for your business blog or to build your first niche site Elegant Themes has got you covered. Elegant themes also have a wide variety of theme suggestions for every niche. They have beautiful templates for business blogs, best charity blog themes and stunning themes for fashion and lifestyle blogs. Similarly, if you want stunning magazine style theme for your fashion blog and beauty blogs you can use its new themes like Divi and Extra. In a nutshell, during this Elegant Themes Review, we found that Elegant Themes Shop is a modern, value for money WordPress Theme Shop. They have a variety of themes that fits any niche like fashion blog themes, professional business themes and even a versatile DIVI builder to design from scratch. Elegant themes are SEO-optimized, cleanly coded, come with drag & drop builders and can be customized easily by non-coders. For only $89 you get access to 87 premium themes along with bloom (email popup and content upgrade plugin) and monarch social sharing plugins. Elegant Theme offers 87 Themes for $69, i.e., less than $1 per theme! Elegant Themes is trusted by 437,821 users worldwide. Best Customer Support with dedicated helpline. Their blog serves the WordPress communities with over 27.8 million page views, pretty popular, right? MUST READ: DIVI vs Genesis vs Thrive Themes vs MyThemeShop: Who Is The Winner? 1) Are Elegant Themes Search Engine Friendly (SEO Optimized)? 2) Elegant Themes Design Overview: Are these really user-friendly themes? 3) Does Elegant themes support page templates & page builders? 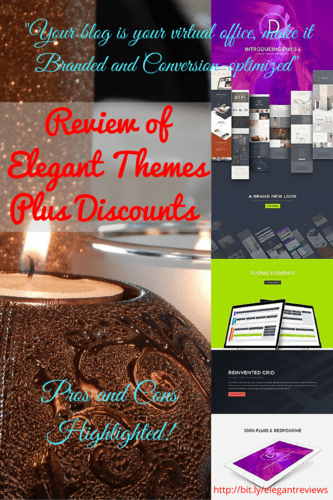 5)Elegant Themes Pricing Review: Are Elegant Themes Affordable or Costly? 6) Technical Support: Does Elegant Themes provide prompt customer service? b) Foxy: The best theme for business blogs and professional sites. 8) Why Elegant Themes? Are Elegant Themes worth your investment? 9) Elegant Themes Coupon: Does Elegant Themes Offers Discount? [/page_section] [page_section color=’#F7F7F7′ textstyle=’dark’ position=’default’]Like any other premium WordPress Themes, Elegant Themes have their own framework that is loaded with the essential SEO features. Let us review how Elegant Themes stand on the SEO test. By default, each blog displays its title as a sum of its name and description. Elegant themes support custom titles changes in case you want to add a different title for your homepage. This feature makes your theme more optimized to generate clicks from google SERPs. The meta descriptions are important for search engines like Bing and you can use it to attract your readers to click on your link. Canonicalization is the process of telling search engines which URL is original and what URLs lead to the same version of the original content. This is a highly needed SEO feature that prevents your blog from being penalized for duplicate content. For example, www.domain.com and www.domain.com/index.html lead to the same page but Google considers it as duplicate content. Therefore, it is necessary to use canonical URL’s to point Google to the original source. A lightweight theme is essential to keep your readers as well as for search engine rankings. As for a research, 40% visitors abandon a site that takes more time to load. I just checked one of the posts of their most recent theme and found that it takes about 3 seconds to load! This is pretty impressive since we know it will take lesser on our blogs which are more optimized than theme preview sites. Are you looking for eye catching and stunning WordPress themes? Well, Elegant themes offers the perfect blend of classic minimal themes (for healthcare blogs and charity blogs) and stunning featured themes (for modern fashion and recipe blogs). Most of their themes are HTML5 compatible. Themes by elegant themes are in accordance to new mobilegeddon norms and coded as responsive web design (RWD). ravishing magazine blog themes that focuses on content optimization. In this review of elegant themes, you’ll find their themes are focused on storytelling and yet design friendly. Elegant themes take pride on their most smartest and beautiful theme DIVI. When it was launched it became the talk of the town and took web design trends to a whole new level. It is the most efficient multi-purpose WordPress Theme that can be customized to almost whatever you want with the drag and drop model without any coding. The Divi theme (the world’s most used WordPress theme (stats by Builtwith.com)) which helps you build homepages, landing pages and engaging blog posts (adding, changing font sizes, boxes/buttons/pricing tables/testimonials etc) without having to touch a single line of code (check out my Divi theme review here). Fun fact: The divi theme is so powerful that you don’t even need to look at any other theme of Elegant themes. It has inbuilt layout packs that gives you pre-built website templates to use. Another theme that is too popular is Extra theme. Here is an overview of the latest Elegant Theme “Extra” and believe me, it’s a miracle. You’d want to use Elegant themes’s Extra theme if you own a blog (may that be a fashion blog or a food blog or any other niche) or a magazine style news blog where you want your content to be seen. Check out its demo here. Below are a few more design parameters in which I reviewed Elegant Themes. The Divi Builder comes with over 40 content blocks that are drag and drop enabled. This forms your different content styles of your blog. They are like content editors and give your blog visual uplift. Most beautiful WordPress Themes? Elegant Themes have great single post layout that gives peak importance to your content. This is very important for user experience and also for conversion. These design layouts are very essential to make your blog posts engaging and reduce bounce rate. Check out the below images to see how you can use one Elegant themes to give your blog to give a different feel according to your blog niche. If you have a huge variety of content then you will find normal themes don’t do justice to your blog. But, Elegant Themes has a new tabbed module to place a wide variety of content categories under one hood. This is what makes “EXTRA” theme by Elegant Themes the most recommended theme for large news blogs, magazine style technology blogs and any blog that gives its content a priority. It can be also the best theme for blogs of schools and educational institutes where you have a lot of content and syllabus. No blog-centric theme can ignore the blog layout of its content. Having your blog articles in the standard blog layout makes it easier to read and decreases bounce rates. Your authors are your blog’s key components. Give them the space they need to show off their character and colors. Elegant themes offer a wide variety of authors page templates to display your author bio, and links to their social profiles. Elegant themes’ Divi Builder contains the very good navigational menus and supports the trendy “Mega Menus”. In fact, Elegant themes has gone one step forward and allows you to show of recent posts and posts from different categories in the menu drop-down. 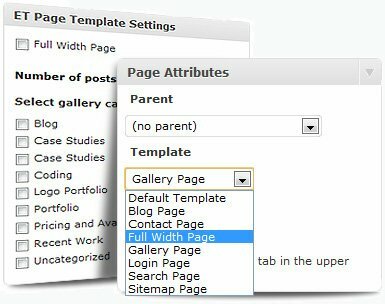 These can be placed as direct article menu, article list menu or direct list mega menu. The timeline design allows you to arrange your posts in a timeline of events like a calendar. This is the same as the Facebook timeline too. Elegant Themes supports maps and multimedia so that if you have a local business you can directly show your address of your offline store or cafe or the event venue with the maps. When you have product reviews you need to have a good theme with review and ratings support so that your review ranks in search engines. The review and rating support of themes by elegant themes are SEO friendly and rich snippets included. This helps your reviews to stand out in search engine rankings. Also, themes by elegant themes allow reviews and user ratings that give the power of reviews to your readers. This is great for product launches and new feature announcement. You can also ask your readers to review and rate your content and plan accordingly. In today’s online world where everyone is selling something or the other how can a premium WordPress theme like Elegant Theme not have shopping integration. When I conducted this Elegant themes review, I found they have awesome eCommerce integrations. Elegant Themes offers stylish shop features which you can see in the image below. This will help you to create your online store easily. These features are a LOT to have a user-friendly experience. [/page_section] [page_section color=’#F7F7F7′ textstyle=’dark’ position=’default’]No premium WordPress theme shop is complete without page templates. And elegant themes being the best premium themes have a great taste for page templates. Page templates by elegant themes have different saved layouts that you can use in any individual page to give it a professional and graphic designer quality look. Again, you don’t have to know the abc of coding to customize Elegant themes! Elegant Themes has more page ready-to-use templates than the themes by StudioPress. These include the templates like blog page templates, contact form template, sitemap template, multimedia gallery template, advanced search page template, a login page template etc. In this Elegant Themes review, we also check their plugin support. Here lies the real treasure. Elegant Themes have some of the best and most used plugins like the monarch social sharing plugin and the bloom lead generation plugin. These are the most used plugins in their own fields. This is the heart of Elegant Theme. This standalone drag and drop builder lets you customize any theme within a fraction of time without any knowledge of coding. I am short of words to describe the plugin. See the image below or view the live demo. Bloom is by far the most converting email optin plugin you’ll ever find. With Bloom, you can easily add opt-in forms to your WordPress sidebar, below posts and under the menu in the header and in any location you want. 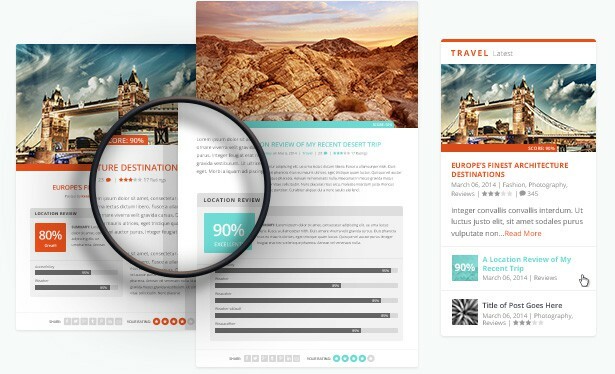 It comes with more than 100 pre-designed templates that are just world class and it also supports detailed insights, conversion rates and other stats of each optin form separately. Note: Bloom email plugin isn’t full fledged like Optin Monster, where you can get tons of options like landing page builder, click link to show pop ups but if you compare the pricing with Optin Monster, Bloom is a no-brainer. Plus , if you want something that is good to use out-of-the-box and doesn’t require time or learning curve, you’ll find bloom useful. Convert readers into loyal followers. View more details of Bloom plugin here. This is the best looking social sharing plugin for WordPress. Monarch comes with tons of features and designs with share counts. A must have plugin to boost your social shares. This comes absolutely free along with Elegant Themes pack for $67. Steal this plugin’s details here. Handheld mobile plugin: to give your blog an even more mobile friendly look and remove the clutter for mobile users. Maintenance plugin: To notify your readers with a coming soon type of template when your site is down or even before it is launched. Elegant Shortcodes: These allow you to call the elegant themes designs anywhere in the theme even if it’s not in their design. A very handy feature for bloggers. All these plugins are absolutely FREE with the Elegant Themes package! If you buy a standalone plugin for each of the above usages, each would at least cost nearly $40-$50 each, leave alone the themes! If you don’t agree, check out the price of optin monster (a similar email optin plugin). View DEMO of all the plugins here. With all the features mentioned above, I would easily pay all the bucks in my pocket but it ain’t be smart and Elegant Themes doesn’t want it too. Elegant Themes comes in a pay for one, use all package! You actually get 87 WordPress Themes for the price of one Theme. 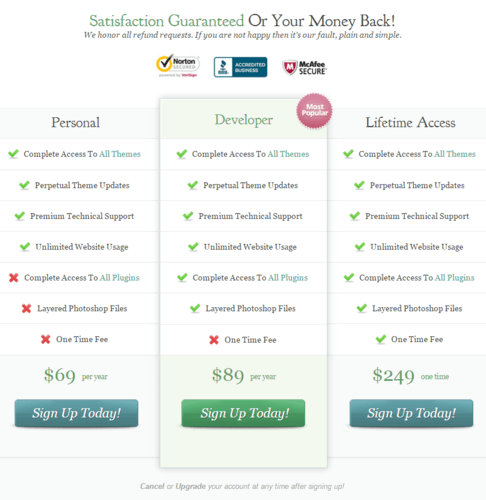 Most Premium Themes use cost around $100 for each theme but Elegant Themes cost only $67 for all their 87 themes! This doesn’t in any case, mean Elegant Themes are any short to standard design norms but the owner Nick Roach and developers want to help everyone avail the best themes without putting a cut in their pockets. They charge what they need and not extra money to call themselves “brands”. If you are a professional designer or a graphic designer in freelance web design business then Elegant Themes are the best for you. You get easy to customize themes that too at affordable price. This will reduce the end cost to your clients while all they get is fantastically designed gorgeous themes designed by you. You can get Elegant Themes package at just $89/year. If you have even researched a bit about other premium WordPress themes like Thrive Themes themes, you’ll find that they charge on a per year basis. But, Elegant Themes allow you to own your themes for lifetime at just $249! This is highly recommended for freelance and professional designers and even for bloggers because why waste money per year when you can get lifetime access, all the updates and even own future themes at just a minimal price of $249. Please Note: In the WordPress blogging business, brands aren’t now giving access to lifetime memberships. They are charging for a continual annual or monthly basis. There are only a handful of “best brands” that give you lifetime access for anything nowadays, and Elegant Themes is one of them you wouldn’t want to miss. Let us now review Elegant Themes based on support and after sales services. Elegant Themes is committed to help you grow your business. These makers of beautiful WordPress Themes are also ever ready to help you with premium technical support. They also have a support forum with 30 or more technical heads to help you solve your smallest glitch in your themes. As long as you own Elegant Themes membership you are eligible for any update that they introduce into their framework. They also make sure your themes is always compatible with the latest WordPress version. Plus, they release brand new themes every month and these could be yours eternally free! Nexus is the most versatile and stylish magazine style theme by Elegant Themes. This is a responsive theme that best suits for any magazine or news blog. Run a fashion or lifestyle blog? Nexus is your theme (view demo). Nexus focuses in showing your content to your readers in the best possible way. It has a strict grid and typographical hierarchy which makes sure readers linger on your site for long. Other features include, ads ready, review ready, social media sharing integrated themes. Foxy is the best theme if you are looking a sleek and professional website. This is the most affordable WordPress theme for hospital and healthcare sites or even company blogs. If you want a easy to customize theme that converts your visitors into buyers/subscribers then you should try Foxy (view demo). I don’t call this a theme! This is an art! If you are creative and want to customize your own theme design, DIVI is your theme. This theme is the most flexible and feature rich theme that you can use for any blog. You can customize it into a business blog or can use it to rock your writer portfolio site. Use DIVI for a wide variety of needs. Elegant Themes recently launched “Extra” their most smart and flexible theme up to date. It uses the DIVI builder an only sky’s the limit to what this theme can do. No Elegant Themes review can be complete without the mention of Extra theme. It is feature laden and yet very fast loading theme. Here is the most detailed review of Extra, (read it now!) the newest and smartest ever theme from Elegant Themes. After this detailed and honest Elegant Themes review, a question arises why you should consider using elegant themes? It’s a known fact that design is the key feature why all blogs get noticed. Most professional bloggers have their own distinct blog design and use premium themes. Besides the good looks, Elegant Themes makes your blog stand out because it has so many features to easily customize or design your blog. Premium themes like Elegant Themes your site becomes more secure than those using free themes or downloaded themes from black hat sites. Elegant Themes are also search engine friendly and user experience optimized. They have great support for monetizations and ad integrations. These themes by Elegant themes are most AdSense optimized themes too, in case you use them. With the excellent themes and plugins, I think these are the best themes for graphic designers and web designers to use in client websites. Since the themes are most affordable, they can help their clients to cut their budget and yet give them stunning personalized themes. Yes! Elegant Themes releases coupons from time to time to reward its users. The discount coupon codes are very useful to get a cut on the normal price of Elegant Themes. I have a section where you can check the latest discount coupon codes for Elegant Themes. When I checked it’s loading speed, I found it was 3 seconds that the post loaded in. I think it can be lowered a bit. They have too much customization options. This can scare away a newbie or a business man who just wants a custom site put up. Apart from this I could not find any disadvantages or cons in the elegant themes product. Elegant themes are as you saw the best affordable WordPress themes. With all the features discussed above, they are the best value for money premium themes. If you want to give your blog a rebrand in this new year or want to give your readers a better user experience, then you must think about Elegant Themes. The plugins which are free with the developer access plan are also a perfect tool for your blogging goals in 2017. You can use them to make your blog more optimized for social sharing and lead generation. So, What are your thoughts about Elegant Themes after reading this review? Have you used Elegant Themes before? If yes, please write your user review of Elegant Themes in the comment below. Also, please tell which theme is the best theme from all Elegant themes? This will help our readers decide the best theme from Elegant themes. I think they are best Genesis StudioPress themes alternative that is drag & drop compatible. Feel free to leave your Elegant Themes user reviews in the comments below. Looking for premium themes to brand your blog? Check out this unbiased Elegant Themes review, one of the most affordable and feature rich theme shop. You get access to 87 beautiful, SEO friendly and Conversion optimized themes for just $69/year. You also get a 30 days money-back guarantee so buying is risk-free. Give your blog the look it deserves! I’ve read that if you use Elegant Themes (Divi in particular) you can’t change themes easily because all the short codes are visible when you do and you spend a ton of time cleaning all that up. Has anyone else heard that or experienced it? This was such a thorough review–thank you! These seem like really lovely themes. Love that drag & drop feature. You do a great job formatting your reviews so they’re easy to read! Much better than a wall of text. I need to explore how to better use Thrive Content Builder for formatting. It is really a fabulous review of Elegant theme – it makes everything clear regarding these themes. Today, most of blogger didn’t provide sufficient information regarding review so it can be very difficult for buyer to select perfect one but I have noticed, you have added almost each and every things regarding these themes. Elegant Themes is one of the first theme foundries to produce really versatile themes that could be transformed to work for a wide range of business purposes. Some of the themes produced by Elegant Themes have become standards of the internet and we’ll bump into them over and over. It’s still a pretty decent theme and the newer ones that Elegant Themes has been producing are even better. Eventually, thanks for sharing your worthy information with us. I really wanted to get Elegant themes for my new online business website and this review of Elegant themes is comprehensive enough for me to decide if they are a good deal. I am hearing a lot of good reviews about Elegant themes and they have good looking themes to choose from till now I used MyThemeShop themes for my blogs I never tried Elegant theme till now but this time I want to test these themes on my blogs. You have given complete informative review about Elegant with cons as well, thanks for sharing information about it, see you soon with another article, keep up the good work as usual. Tried Thesis and StudioPress they are great companies providing great services, but haven’t tried the Elegant unfortunately, definitely love to try it out and wouldn’t you agree the simpler the theme design the better? Thank you for sharing this great post. Great and very informative post. as bloggers we are know how important a theme for our blog is, it should be very clean design, simple, load fast and seo friendly. Thanks fir the review. elegant theme is most recommended as same as genesis framework. Nice review of Elegant theme I Didn’t used it but I know some bloggers who are using elegant them for their blog.I always wanted to have one for my blog .I am also planning to grab good deal of them from elegant soon . Elegant Themes has been my theme shop of choice for a few years. Divi and Extra (and the plugin) has surpassed anything I’ve seen before anywhere, and I’ve tested out so many. It’s totally flexible and customizable but the best part is that you don’t need any coding knowledge. I’m not a site developer, nor do I generally create my own sites. But I have, and I’ve used many different themes, including Thrive, Optimize Press and InstaTheme. They’re all good for different things, but I love the look of Elegant Themes and it certainly is priced very well, especially considering that most of the others require and annual fee in addition. Thanks for the nice review. I’ll certainly pass it on to some folks I coach that like to do their own site development. It’s a treat to see you here! Wow! you have some awesome experience with the best themes in the world. If you don’t mind can you say how are thrive themes in terms of SEO optimization and other uses? Yes, Elegant themes are really beautiful themes and they have so much versatility in usage. The pricing is a deal maker for Elegant themes. Thanks a ton for sharing it with folks that are in this business! It’ll help them in making the right decisions and thus my hard work will be rewarded! Great review indeed. Elegantthemes is a nice theme vendor. I had used so many themes by them as I had 1 year developer license a few years ago. Good to see you writing about them. Yes, elegant themes have been around for quite a while now and I remember how we’d sat and gone through so many of them, when we were deciding for a new theme for Aha!NOW, but that was 2-3 years back. We didn’t go for any of those as we wanted the present magazine kind of look, but yes, they have some lovely themes for sure. You listed the pros and cons so well, and I think they are present with any theme you look up, none being the perfect one, but if the price and features suit your need, go for it! I like the packages they have to offer, and would surely be going through these latest themes you mentioned in this post as well.